SINGAPORE - The building of an unauthorised road has been fingered as one factor that intensified the flash flood in Tampines Avenue 12 on Jan 8. A construction company had built a temporary access road over a drain there without seeking approval, national water agency PUB said on Wednesday (Jan 17). This prevented water from the downpour that day from flowing out of the area quickly enough. Furthermore, an unblocked drain next to Tampines Avenue 12 was already overwhelmed and could not cope with the deluge, said PUB. On Jan 8, flash floods occurred in nine locations in eastern Singapore. Within just four hours, 118.8mm of rain was recorded at the Kim Chuan Road rain gauge. That amount is about half of Singapore’s average monthly rainfall for January. 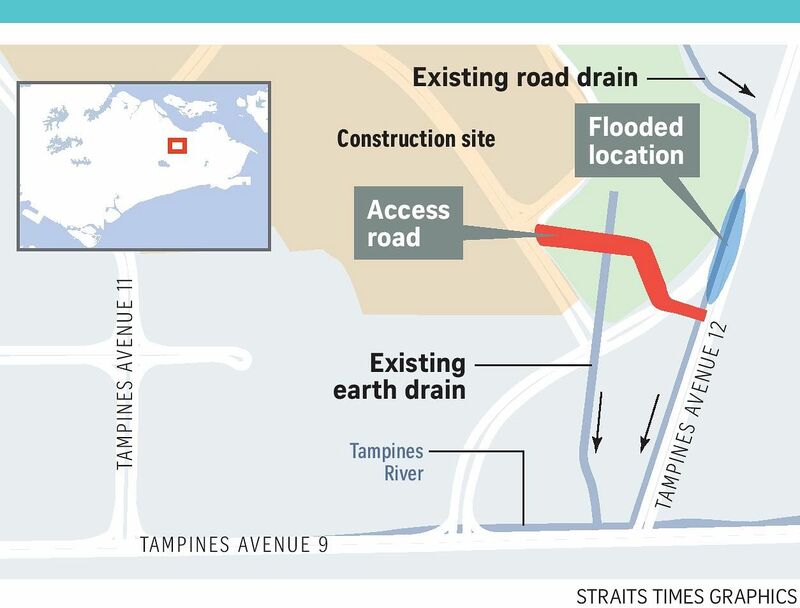 All the reported flood areas are low-lying grounds with drainage works in progress, except for Tampines Avenue 12. Director of PUB’s catchment and waterways department Yeo Keng Soon said on Wednesday that investigations into the floods in the other eight locations were completed on the day of the floods, however, more time was needed for investigations into the Tampines one. The road will be removed by the end of the week, and drainage for the area will be improved, said Mr Yeo. A permanent drainage system will eventually be built on the site. Mr Yeo added that further investigation would be needed before PUB decides if any action needs to be taken against the construction company, Huationg Contractor. Site developer, the Housing Development Board (HDB), said Huationg built the temporary road that covered the earth drain without getting approval because they thought it was “abandoned”. HDB is also investigating. Construction firms have been linked to floods in the past. For instance, Sato Kogyo altered the public drainage system across Upper Thomson Road (near Lorong Mega) without PUB’s approval, contributing to flooding in the area on Dec 24, 2016. Despite the country’s best measures, Singapore can never completely prevent floods, Mr Yeo said. Limited land, a need to prioritise resources, as well as increasingly extreme weather due to climate change all conspire to make this task impossible, he added. Mr Yeo said climate change trends suggest that worst-case-scenario storms of the future could be even more intense than what today’s planning models can forecast, leading to a perpetual game of cat and mouse. Singapore’s flood-prone areas – low-lying parts of the country with a history of flooding – cover less ground than before. From 3,178ha in 1970, they now stand at 30ha, a reduction of 99 per cent. But floods will always be part of Singapore’s landscape, said Mr Yeo, and the water agency is bracing itself to deal with more sudden, intense deluges. He added that Singaporeans themselves can help to deal with floods by being prepared and staying aware of floods when they happen. “When there is a flood, the behaviour of residents is vital to building safe communities in flood-prone areas. So when one occurs, do not walk or drive through flood waters. Mr Yeo said the public can use the MyWaters app or PUB’s own website to get real-time information on floods. Through these platforms, they can get live video feeds of almost 50 low-lying spots, as well as real-time updates of water levels at 209 drain locations around Singapore. The public can also subscribe to SMS alerts on the water level at specific drains and locations, so they can find out which areas to avoid during floods.